The Earth Rotates around 1,042 MPH while it Orbits the Sun around 66,666 MPH, while the Sun rotates around 4,400 MPH, while the Solar System is Orbits around 666,666 MPH around the Galaxy, and of course the Galaxy travels through the Universe at the Speed of Light which is 670,616,629 MPH, I just can never get away from the Numbers 666, which is why we are always in a hurry to get somewhere, and never have the Time to do the things we want to do, like watch the Sun as we Travel around it in 360 Degrees, which takes a Year, and this Series starts in the Year 2012, and will finish in 2016, at which point I will make it all one Video, so you can watch all the Sun all the Time, so hold tight because we are moving a lot faster than it feels. I took all the SDO images for the Year 2012 Courtesy of NASA/SDO and the AIA, EVE, and HMI science teams, and edited out the bad ones, and was left with 29,296 images at 4096 resolution in AIA 193 format, so I can make higher resolution videos then the 1080 I uploaded here. Some Images are missing, the Cameras sometimes do not take a good shot, and the Satellite had a few issues so its missing a few days of images, so the video will appear to jump, slow down and speed up, but over all I think it came out great, so thanks for the SDO mission for this one. I composed and played all the Music and Sound Effects on my 12 String and Fender Stratocaster, I am a Medically Retired Disabled Gulf War Vet, I have a PhD in Physics where I explain the Science of the Universe in a way that would make the Last Magician Sir Isaac Newton and Albert Einstein Proud, Einstein only believed in Newton, and not his own Theory of General Relativity which he renounced as the truth making it Science Fiction, the Last Wizard was Nikola Tesla who said Light is Everything, and we are Light Beings, Newton said Christ was inserted into the Bible, so it was Jesus Bar Abbas who said God is All Light without Darkness, and Newton proved we can only see the Darkness and call it the Light, so Light is Energy like Electricity at a lower frequency, so God is Energy, because God is the Light inside every Atom, and the Sun of God is what this video is all about. You can see Venus transit the Sun on June 5 and 6, and see the Moon pass in front on Feb 21 and April 21. I am posting this on the day my wife&apos;s Grandson was born, so this one is for Ryder. The Earth Rotates around 1,042 MPH while it Orbits the Sun around 66,666 MPH, while the Sun rotates around 4,400 MPH, while the Solar System Orbits around 666,666 MPH around the Galaxy, and of course the Galaxy travels through the Universe at the Speed of Light which is 670,616,629 MPH, I just can never get away from the Numbers 666, which is why we are always in a hurry to get somewhere, and never have the Time to do the things we want to do, like watch the Sun as we Travel around it in 360 Degrees, which takes a Year, and this Series starts in the Year 2012, and will finish in 2016, at which point I will make it all one Video, so you can watch all the Sun all the Time, so hold tight because we are moving a lot faster than it feels. I took all the SDO images for the Year 2013 Courtesy of NASA/SDO and the AIA, EVE, and HMI science teams, and edited out the bad ones, and was left with 32,781 images at 4096 resolution in AIA 193 format, so I can make higher resolution videos then the 1080 I uploaded here. You can see the Moon pass in front on March 11 and August 6. The Earth Rotates around 1,042 MPH while it Orbits the Sun around 66,666 MPH, while the Sun rotates around 4,400 MPH, while the Solar System Orbits around 666,666 MPH around the Galaxy, and of course the Galaxy travels through the Universe at the Speed of Light which is 670,616,629 MPH, I just can never get away from the Numbers 666, which is why we are always in a hurry to get somewhere, and never have the Time to do the things we want to do, like watch the Sun as we Travel around it in 360 Degrees, which takes a Year, and this Series starts in the Year 2014, and will finish in 2016, at which point I will make it all one Video, so you can watch all the Sun all the Time, so hold tight because we are moving a lot faster than it feels. 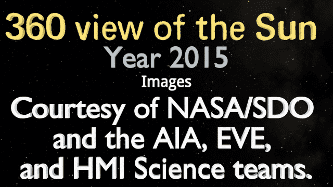 I took all the SDO images for the Year 2014 Courtesy of NASA/SDO and the AIA, EVE, and HMI science teams, and edited out the bad ones, and was left with 33,363 images at 4096 resolution in AIA 193 format, so I can make higher resolution videos then the 1080 I uploaded here. You can see the Moon pass in front on January 30, July 26 and September 24. The Earth Rotates on its axis around 1,042 MPH while it Orbits the Sun around 66,666 MPH, while the Sun rotates around its axis around 4,444 MPH, while the Solar System Orbits around 666,666 MPH around the Galaxy, and of course the Galaxy travels through the Universe at the Speed of Light which is 670,616,629 MPH, I just can never get away from the Numbers 666, which is why we are always in a hurry to get somewhere, and never have the Time to do the things we want to do, like watch the Sun as we Travel around it in 360 Degrees, which takes a Year, and this Series starts in the Year 2012, and finish in 2016, although I am still at it now, so you can watch all the Sun all the Time, so hold tight because we are moving a lot faster than it feels. I took all the SDO images for the Year 2015 Courtesy of NASA/SDO and the AIA, EVE, and HMI science teams, and edited out the bad ones, and was left with 33,725 images at 4096 resolution in AIA 193 format, so I can make higher resolution videos then the 4K I uploaded here. Some Images are missing, the Cameras sometimes do not take a good shot, and the Satellite had a few issues so its missing a few hours of images, so the video will appear to jump, slow down and speed up, but over all I think it came out great, so thanks for the SDO mission for this one. You can see the Moon pass in front on October 12. I used a Mask to remove the hard line of the Bloom that did not fit in the image, due to the way NASA decided to zoom in too close, thus getting a better image of the Sun itself, but losing the Bloom on the sides of the Sun at different times of the year, so the Mask was my last option I wanted to use since it just loses more bloom, but my attempt at trying to do the bloom by hand failed, and all my attempts at using Blender or GIMP to fix the problem also failed even worse, so this is a compromise, its better than the hard line. I took all the SDO images for the Year 2012 Courtesy of NASA/SDO and the AIA, EVE, and HMI science teams, and edited out the bad ones, and was left with 33,475 images at 4096 resolution in AIA 193 format, so I can make higher resolution videos then the 1080 I uploaded here. I composed and played all the Music and Sound Effects on my 12 String and Fender Stratocaster, I am a Medically Retired Disabled Gulf War Vet, I have a PhD in Physics where I explain the Science of the Universe in a way that would make the Last Magician Sir Isaac Newton and Albert Einstein Proud, Einstein only believed in Newton, and not his own Theory of General Relativity which he renounced as the truth making it Science Fiction, the Last Wizard was Nikola Tesla: who said Light is Everything, and we are Light Beings, Newton said Christ was inserted into the Bible, so it was Jesus Bar Abbas who said God is All Light without Darkness, and Newton proved we can only see the Darkness and call it the Light, so Light is Energy like Electricity at a lower frequency, so God is Energy, because God is the Light inside every Atom, and the Sun of God is what this video is all about. I almost died on 1 January 2017: when my Diverticulitis ruptured and infected my Colon with 1 inch thick pus from one end to the other, I had an Emergency Colectomy, a few weeks later I was back in the Emergency Room again with Clostridium Difficile Colitis which almost killed me again, then a week later the infection when to my Appendix and the Appendicitis almost killed me again, they almost had to remove my whole colon due to the infection, but I had a great surgeon who saved my life, so thanks to Dr Data I did not die, they also found that I have 2 Spleens, very Rare, like my Lymphoma, and just as useful, who said two Spleens are better than one? I lost count of how many times this almost killed me in the last 22 years since I got this in Kuwait during the Gulf War, or 30 Year War, but the VA saved a ton of money by refusing to do the surgery and then cutting my Antibiotics in half - from what the Civilian Hospitals prescribed, causing the infection to last for 6 years straight... This is the reason I did not have this video ready to post on the first of January. I used a Mask to get rid of the hard edges of the Sun&apos;s Bloom, and also used the 4K format; so the previous video is much different. The Earth Rotates around 1,042 MPH while it Orbits the Sun around 66,666 MPH, while the Sun rotates around 4,400 MPH, while the Solar System is Orbits around 666,666 MPH around the Galaxy, and of course the Galaxy travels through the Universe at the Speed of Light which is 670,616,629 MPH, I just can never get away from the Numbers 666, which is why we are always in a hurry to get somewhere, and never have the Time to do the things we want to do, like watch the Sun as we Travel around it in 360 Degrees, which takes a Year, and this Series starts in the Year 2012, and will finish in 2017, at which point I will make it all one Video, so you can watch all the Sun all the Time, so hold tight because we are moving a lot faster than it feels. I took all the SDO images for the Year 2012 Courtesy of NASA/SDO and the AIA, EVE, and HMI science teams, and edited out the bad ones, and was left with 33,752 images at 4096 resolution in AIA 193 format, so I can make higher resolution videos then the 4K I uploaded here. The Earth Rotates around 1,042 MPH while it Orbits the Sun around 66,666 MPH, while the Sun rotates around 4,400 MPH, while the Solar System is Orbits around 666,666 MPH around the Galaxy, and of course the Galaxy travels through the Universe at the Speed of Light which is 670,616,629 MPH, I just can never get away from the Numbers 666, which is why we are always in a hurry to get somewhere, and never have the Time to do the things we want to do, like watch the Sun as we Travel around it in 360 Degrees, which takes a Year, and this Series starts in the Year 2012, and will finish in 2018, until I feel like doing 2019, at which point I will make it all one Video, so you can watch all the Sun all the Time, so hold tight because we are moving a lot faster than it feels. 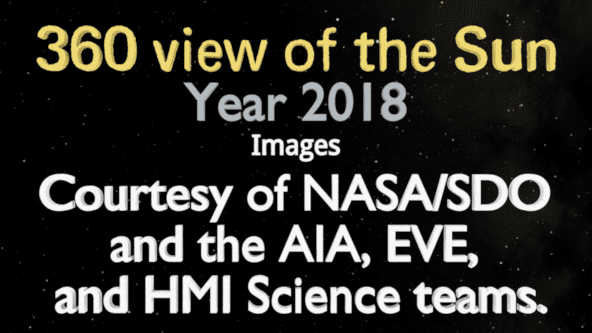 I took all the SDO images for the Year 2012 Courtesy of NASA/SDO and the AIA, EVE, and HMI science teams, and edited out the bad ones, and was left with 33,897 images at 4096 resolution in AIA 193 format, so I can make higher resolution videos then the 4K I uploaded here. The Moon will pass in front of the Camera on: 2018-09-09 at 20:38:27, and 2018-11-07 at 20:23:24 and at 21:08:47. I have been making these Sun Videos for years, and I have come to become familiar with some of the issues with the images provided by NASA, besides the normal lens rotations, that I have to remove, so you do not see the Sun Rotation around on its other axis, like a clock, and the normal 6 AM legs alignment issue, this year I see images that seem to run backwards, and I did remove most of those frames, but you might still see the start of the backwards movement, no idea what causes it, the Satellite is getting old, and they need a new one. The Earth Rotates around 1,042 MPH while it Orbits the Sun around 66,666 MPH, while the Sun rotates around 4,400 MPH, while the Solar System Orbits around 666,666 MPH around the Galaxy, and of course the Galaxy travels through the Universe at the Speed of Light which is 670,616,629 MPH, and combining 3 years I have 66 Minutes and 16 Seconds of Video, I just can never get away from the Numbers 666, which is why we are always in a hurry to get somewhere, and never have the Time to do the things we want to do, like watch the Sun as we Travel around it in 360 Degrees, which takes a Year, and this Series starts in the Year 2012, and will finish in 2016, at which point I will make it all one Video, so you can watch all the Sun all the Time, this is what I have so far, so hold tight because we are moving a lot faster than it feels. I took all the SDO images for the Year 2012, 13, 14, 15 and 16 Courtesy of NASA/SDO and the AIA, EVE, and HMI science teams, and edited out the bad ones, and was left with 129,165 images at 4096 resolution in AIA 193 format, so I can make higher resolution videos then the 1080 I uploaded here. In 2012 you can see Venus transit the Sun on June 5 and 6, and see the Moon pass in front on Feb 21 and April 21. In 2013 you can see the Moon pass in front on March 11 and August 6. In 2014 you can see the Moon pass in front on January 30, July 26 and September 24. In 2015 you can see the Moon pass in front on October 12. I almost died on 1 January 2018: when my Diverticulitis ruptured and infected my Colon with 1 inch thick pus from one end to the other, I had an Emergency Colectomy, a few weeks later I was back in the Emergency Room again with Clostridium Difficile Colitis which almost killed me again, then a week later the infection when to my Appendix and the Appendicitis almost killed me again, they almost had to remove my whole colon due to the infection, but I had a great surgeon who saved my life, so thanks to Dr Data I did not die, they also found that I have 2 Spleens, very Rare, like my Lymphoma, and just as useful, who said two Spleens are better than one? 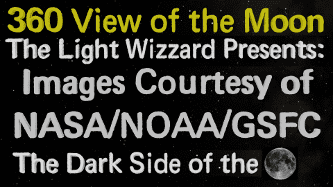 The Light Wizzard 360 View of the Moon, you can now see the Darkside of the Moon. The Images were taken from the NASA LRO Missions, 36 Wide Angle Camera (WAC) images were seamed together to create this video with the thanks to the NASA LROC Team, I added Music and Stars to show case their work. I composed and played all the Music and Sound Effects on my 12 String and Fender Stratocaster, I am a Medically Retired Disabled Gulf War Vet, I have a PhD in Physics where I explain the Science of the Universe in a way that would make the Last Magician Sir Isaac Newton and Albert Einstein Proud, Einstein only believed in Newton, and not his own Theory of General Relativity which he renounced as the truth making it Science Fiction, the Last Wizard was Nikola Tesla who said Light is Everything, and we are Light Beings, Newton said Christ was inserted into the Bible, so it was Jesus Bar Abbas who said God is All Light without Darkness, and Newton proved we can only see the Darkness and call it the Light, so Light is Energy like Electricity at a lower frequency, so God is Energy, because God is the Light inside every Atom, and the Sun of God is what this video is all about, but in our Darkest hour, the Moon shows us the Light of God&apos;s Sun, so this is the Darkside of the Moon.